NADH + CoQ10 by MAAC10 provides the BEST VALUE! - 60 chewable tablets | 50mg PANMOL NADH + 100mg CoQ10 per serving| ENERGY | ANTI-AGING | ANTIOXIDANT. NADH and CoQ10 are natural coenzymes that serve both as Antioxidants and as electron carriers, protecting the mitochondria while promoting ATP energy production. NADH + CoQ10 work synergistically to ensure energy efficiency, boosting athletic performance, physical endurance and mental focus. NADH + CoQ10 is also a potent Antioxidant combination that helps neutralize cytotoxic radical and peroxides. NADH is the reduced form of Nicotinamide Adenine Dinucleotide NAD+ and used as substrate that stimulates DNA repair and Sirtuin gene regulation for real Anti-Aging benefits. Each molecule of NADH contains stored energy, and will release 2 high-energy electrons eventually carried by CoQ10 resulting in the production of ATP Cellular Energy. CoQ10 is required as an electron receiver, which helps to reduce electron leakage and the formation of excessive ROS (reactive oxygen species). **This product is NOT intended to replace or work like caffeinated products. While some people do report an instant energy effect, the results may vary from person to person and is dose-dependent. We encourage our customers to take a longer term outlook, over time the pool of NADH + CoQ10 should improve and so will basal energy levels, metabolic function and fatigue. 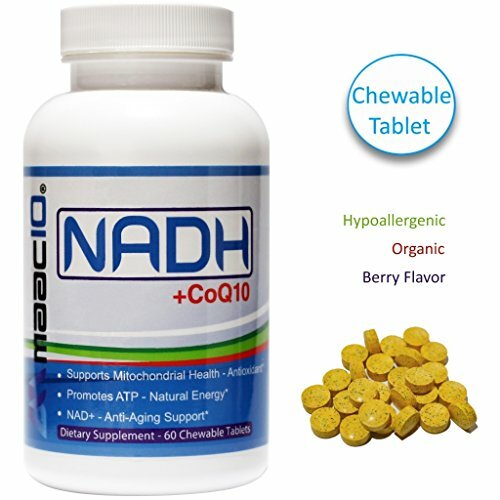 (Formula Updated for Better Taste) NADH + CoQ10 is a versatile super-nutrient combination that uniquely promotes cellular energy by donating high-energy electrons to the body that creates ATP Energy. NADH + CoQ10 is particularly helpful with fatigue, low-energy, metal focus, stamina and exercise endurance. NADH + CoQ10 is powerful antioxidant combo against lipid-peroxidation and is a great addition to any serious ANTI-AGING NAD+ Boosting regimen! NADH is Reduced Nicotinamide Adenine Dinucleotide! SUPPORTS: Healthy Metabolic Function, Immune Response, Heart Health, Neurological and Brain Function. New Hypoallergenic Organic Berry Flavor: Gluten Free, NO egg, peanut, milk, tree nuts, fish or crustacean. If you have any questions about this product by MAAC10 Formulas, contact us by completing and submitting the form below. If you are looking for a specif part number, please include it with your message.